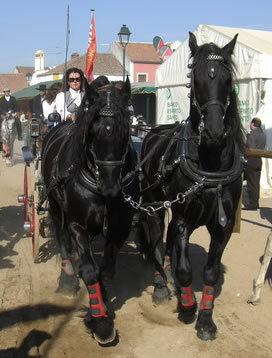 The Golegã Horse Fair which is also known as the National Horse Fair held every year in November, is a celebration of the Lusitano breed. 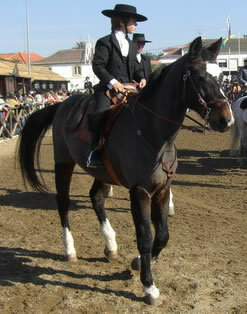 The fair is held at Golegã in the Ribatejo region of Portugal. Golegã is 133 km north east of Lisbon on the west side of the river Tejo. Read MARTIN NORTHEY's account of his time at the horse fair. 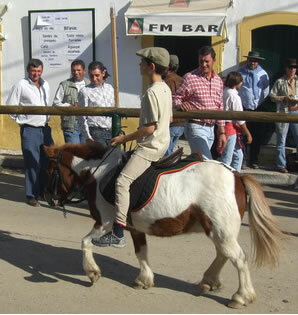 The roots of Golegã horse fair, originally called "Feira de São Martinho", go back to the early 18th century. It was started to promote the trade of agricultural products from the area around Golegã. In addition, the Lusitano horse became part of the fair owing to there being several well known Lusitano breeders in the Golegã area. In about 1773, the Marquês de Pombal, the Prime Minister of Portugal, encouraged Lusitano breeders to show their horses and quickly Lusitano horses became the main attraction of the fair and people from all over Portugal came to Golegã to see and to buy and sell horses. 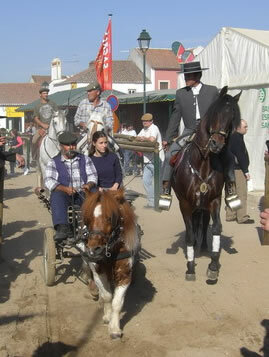 Later, with the awareness of the Lusitano breed in other countries, people from outside Portugal began to visit the horse fair. 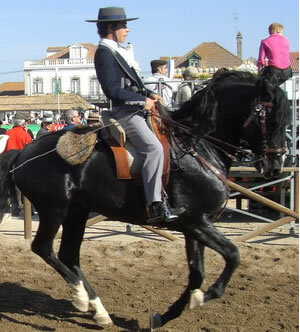 In 1972, in order to reflect its importance for horses and their breeders in Portugal, the name of the fair changed to National Horse Fair "Feira Nacional do Cavalo". The fair normally takes place over 10 days and the most important day is the 11th of November which is the day on which most Portuguese people enjoy the tradition of eating roasted chestnuts (castanhas). The Lusitano derives its name from Lusitania, the name which the ancient Romans gave to the part of the Iberian peninsula that corresponds roughly to modern Portugal and much of modern Spain. 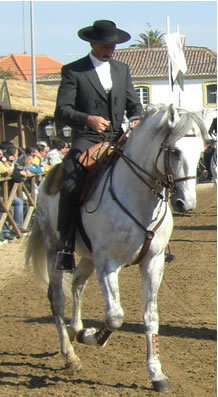 Lusitanos and Andalusians originally were registered together under the Spanish Stud Book, but the breeds separated in 1960. At that time Portuguese breeders began to improve the breed and concentrate on the distinct qualities of the Lusitano, which consist of a flashy gait, strong bones and a powerful presence. The Portuguese still fight bulls from horses (the Spanish don't anymore) and so have kept these distinct historic characteristics in the modern Lusitano, which are ideal for riding in a bull ring in close proximity to a dangerous bull. 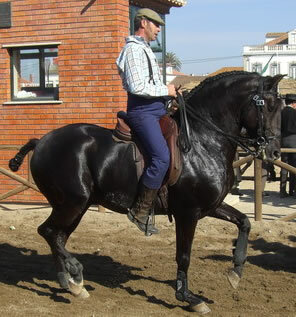 Temperamentally, the Lusitano has a reputation for courage, with a tendency to move forward towards anything that threatens rather than away from it, combining calmness with great fire when being ridden. 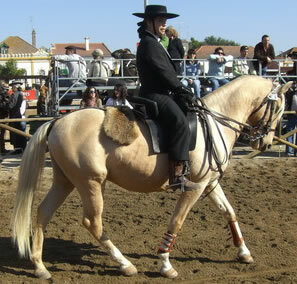 Lusitanos are reputed to be intelligent, to possess a sensible, levelheaded temperament and a tendency to bond strongly with humans. 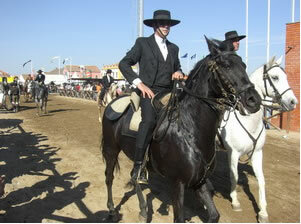 They have great balance, a majestic appearance, great physical strength and are very comfortable to ride. It is therefore not surprising that until about 100 years ago when cavalry regiments were still using horses in battle, Lusitanos were much in demand as cavalry mounts. Lusitanos are extremely powerful and strong and often have a Roman nose, they are compact, with powerful hindquarters, some have a natural high-stepping action, and they have a thick mane and tail, a short back, and a broad chest. They are usually bay or black in colour, but occasionally palamino and often turn gray in old age. They vary in height from about 15 to a maximum of 16 hands. We went up to Golegã for a day and a night in November 2007, we stayed at a hotel about 30 kilometers away near Abrantes, despite a thorough search on-line a few days before this was as close as we could get, all the other hotels in the area were totally booked up and we were told that the room that we booked was the last one available. Having been to many horse shows in England, my expectations of the Horse Fair at Golegã were far different from the reality that we found when we arrived there. Having been guided to the town by 'Jane' the voice on my motorbike's Tom Tom. I expected to see the Portuguese equivalents of signs such as 'To the show' – 'Horse Boxes this way' – 'Competitors only' – 'Car parking' - etc etc. But there was nothing! Not even a sign to tell us where either the Fair was (I had imagined that it would take place in a show ground somewhere outside the town) or which way to go to get to the center of the town. We turned into the town and began to realise that people were parking where ever they could on the side of the road, being on a motorbike made this quite easy and we found a place very quickly. Leaving the bike there, it seemed sensible just to follow the direction that everyone else was walking in. After about 10 minutes we reached the town center and a milling mass of people on foot, people riding horses and driving carriages. The seemed to be little or no formal organisation. The center of the town square had been fenced off as the show ground and around the outside a track created around which people were riding the horses and driving carriages, some walking, some trotting and some cantering. 98% were going in an anti-clockwise direction with just a few going the other way. Any spectators who wanted to reach the middle of the square had to take their chances and run across when an opportunity arose. As we entered the square we had a near miss with a four wheel carriage and four horses who turned down a side street at a fast trot to leave the perimeter track, flattening ourselves against the wall of a house we managed to avoid being run down! It would have made a good photograph but I was too busy getting out of the way! Golegã is a very small town with a population of just 5,700 people and at the time of the horse fair is completely taken over by the fair. People and horses come to the fair from all over Portugal, some wearing wonderful traditional riding clothes others not as you will see from some of the photographs that I took. Men and women wear almost the same (I didn't see any women riding side saddle), consisting of a wide brimmed hat with a chin strap, a short dark coloured jacket and waistcoat, a white shirt with no tie and dark trousers with brown or black boots with spurs. The women appeared to be wearing long skirts when not riding, but they were in fact culottes and so looked very feminine when on their feet but were in fact ideal for riding. 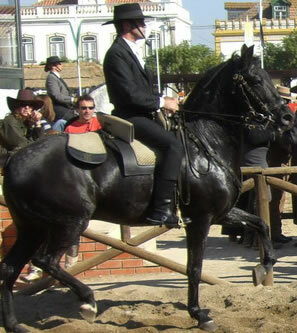 Even the riders who were not wearing traditional clothing, were using traditional Portuguese saddles and almost all had a pad for a pillion attached behind the saddle. Most bridles appeared to be double bridles. 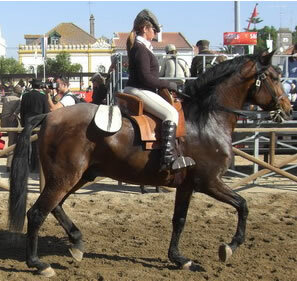 The Portuguese traditional riding seat involves having long stirrup leathers, and the body in an upright position.